As the school year approaches we are nearing completion of Phase 1 work at Boston Prep. We are excited to be one of five teams selected to participate in Detroit’s Give a Park, Get a Park design competition. Part of the Knight Foundation Cities Challenge; Give a Park, Get a Park is an open competition that connects community with designers to refine ideas for a new Morningside community park. We will be heading to Detroit to partake in a Design Charrette with the Community on Saturday, August 26. As construction continues at the site, final color decisions are being made for the myriad of materials being used at Hoyt Sullivan Playground in Somerville. See the latest news post here. 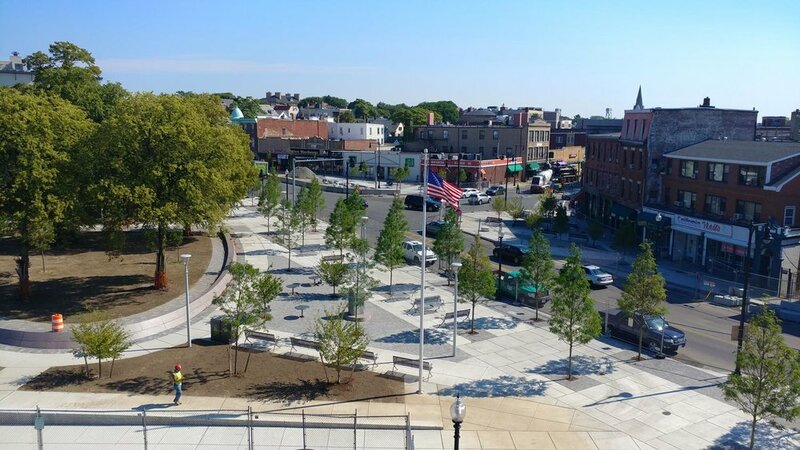 After an engaging and dynamic design and public process, Central Square in East Boston is nearing completion. The ribbon cutting for the new square is currently scheduled for mid-September. Kaki recently attended the ground breaking of Bobbie’s Meadow, a new outdoor space at The Eric Carle Museum of Picture Book Art in Amherst, MA. Bobbie’s Meadow is dedicated to the memory of The Carle Museum’s co-founder Barbara Carle. We are excited to be working on this project with Meyer + Silberberg that reflects Bobbie’s generous spirit and her commitment to art, children and the environment. The site is scheduled to open June 23, 2018. Our work at Suffolk University's Roemer Plaza was recently featured on Landezine. Read the full post here. Back in May Mark joined Marie Law Adams of Landing Studio and Andrew Howard of Better Block Consulting on the fourth and final panel discussion of Fulfilling the Promise: Community Building and the Emerald Necklace. The open discussion revolved around ideas to help successfully complete Boston's Emerald Necklace along Columbia Road. Check out the full discussion on the BSA website here. Paving is down and trees are in as construction is moving along at Central Square in East Boston. An original Olmsted landscape, we are excited to see our design that celebrates the original plan, but updates its relationship to the current surrounding infrastructure come to life after years of planning and community involvement. The site is scheduled to open later this summer. Congrats to D.W. Arthur Associates and team for their Boston Society of Architects Small Firms Design Award for the David H. Koch Childcare Center! Congratulations to Touloukian Touloukian for the Honor Award for Design from the Boston Society of Architects for their work of meticulously restoring the 1887 gatehouse at Fisher Hill Reservoir Park. We are gearing up for construction as the plans to transform Hoyt-Sullivan Playground in Somerville get finalized. In a recent article our enthusiasm for the park is shared by the City of Somerville. We are hoping the park to be completed by late fall and the Director of Parks and Open Space for Somerville, Arn Franzen believes it's "shaping up to be the best in the city." We'll be sharing updates as Hoyt-Sullivan playground takes shape later this summer. Read the rest of the Hoyt-Sullivan article here. We are excited to announce that our work with the city of Providence and Rhode Island Public Transportation Authority (RIPTA) for Kennedy Plaza received a Merit Award for Design by the Boston Society of Landscape Architects. Kennedy Plaza is once again a space for pedestrians. By removing the interior bus lanes and pushing the bus berths to the periphery the pedestrian space was doubled making it a true “plaza” in scale and character. The design deploys long groves of trees and a contemporary paving palette to reinforce the Plaza as a place of prominent scale functioning as a venue for events and festivals during non-peak ridership and comfortably for individuals catching the bus. Thank you to the BSLA for recognizing the quality design solutions that can be executed with a limited budget and all who made this project possible. Kaki has joined the editorial board of Architecture Boston. Check out the latest issue where she talks about design, healthcare, and the approach taken to incorporate landscapes at Brigham and Women's Hospital campus in 'Time to Heal'. We are excited to announce our partnership with Meyer + Silberberg Land Architects to create a new garden for The Eric Carle Museum of Picture Book Art in Amherst, Massachusetts. “Bobbie’s Garden” will be a garden in memory of museum co-founder Barbara Carle. "Mrs. Carle loved gardens and was a lifelong environmentalist. She was an educator and she was passionate about The Carle as a place for community members to enjoy art, gather, talk, read and play." We look forward to creating a space that not only celebrates Mrs. Carle, but also supports her lifelong passions. Read more from The Carle's Press Release. As Kendall Square has experienced rapid growth over the past few decades, it also had to better “perform as an inter-modal transportation hub,” said Kaki Martin, ASLA, a principal with Klopfer Martin. The high-tech firms and university alike wanted easier inter-connections among the subway station and sidewalks, bike lanes and bikeshare system, and corporate shuttles and buses. After 2 years of planning and coordination, AIAS Forum 2016 Boston is here and will be running Thursday, December 29 through Sunday, January 1. Our very own Dan Cournoyer has been instrumental, as site director, working with a committee of seven other AIAS members (Jared Guilmett, Merna Haddad, Samantha Veldhuis, Patrick Myers, Andrea Welsh, Julia Edgerton and Tyler Nguyen) to plan this year’s Forum. The event is co-hosted by Wentworth Institute of Technology and MASSART. Congratulations to all for the work to bring this event to Boston! We are excited to see Brigham and Women’s Garden Café open and thriving after a 14 month renovation. An integral project in our landscape master planning effort at the Hospital, we collaborated with Bruner/Cott Architects to redesign the Café with a focus on patients’ experience of the outdoors. The original cafe, which was part of a Bertrand Goldberg building designed in the 1970’s, had low ceilings and small windows that allowed in minimal natural light. The design solution called for removing large portions of the exterior walls, from floor to ceiling, allowing for light to reach deep into the interior and providing full, unrestricted views to the outdoors. Two planted terraces are cantilevered off of the building at the second floor level, giving café patrons a close view of a rich and diverse plant palette. After being closed off to the outdoors for so long the space now allows natural light to flood indoors providing a more relaxed and comfortable environment. Fisher Hill Reservoir Park picked up its second award! The Architectural Precast Association selected the precast water feature at Fisher Hill for their Awards for Excellence. The idea behind the inclusion of a water feature at the park is to reinforce the fact and connection that this park was once a functioning reservoir. One of the driving forces of the design was to create a water feature that could stand alone as a sculptural element when there is no running water. The design features four different precast finishes set on different planes. The idea behind the different finishes and planes is to observe how water responds to the piece, creating ripples and catching light in distinct ways. The water feature sits to one side of the main promenade with a gentle slope into the moving water flow which allows kids to easily engage with the piece. See more of Fisher Hill Reservoir Park.